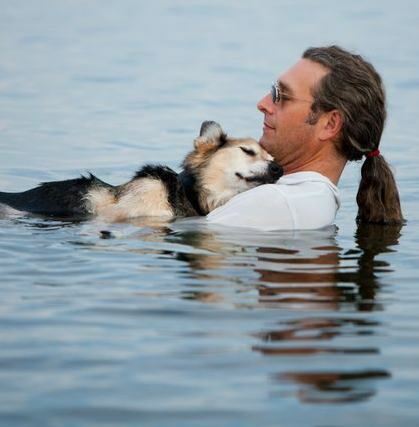 This is 19-year-old Schoep being cradled in his father’s arms in the warm waters of Lake Superior. The arthritic dog falls asleep every night after he is carried into the lake where the buoyancy of the water soothes his aching body. The man’s friend is professional photographer Hannah Stonehouse Hudson who took this photo during one of their therapeutic evening swims. She posted it on Facebook and it went wildly viral, with thousands of people sharing it and 28,294 comments (and counting). Hannah specializes in relationship photos, like married couples and families — and pets with their owners. Visit her website, StonehousePhoto.com, or see her photos on Facebook: facebook.com/WisconsinWeddingPhotography. I enjoy all your articles, but I particularly enjoy the ones about animals. This photograph is absolutely beautiful and touches my heart. I loved reading all the comments on the Facebook page. Thank you so much for the post and making my day. I want to go home now and give my dog a big hug and kiss.